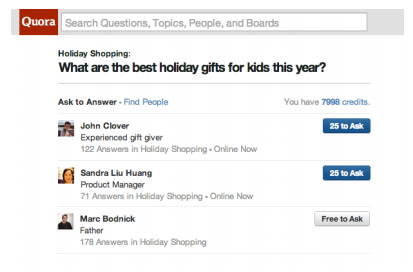 Quora is ramping up its efforts to help answer people’s questions. On the heels of its “Top Writers” news, the service has launched a faster way for users to get answers to their questions from an expert in real-time. Called Online Now, this new feature will enable users to contact someone with a penchant for providing “high quality” answers to respond to their query. If you’re not familiar with the service, Quora functions pretty much as a social message board where people can ask any questions they want and have others respond, with responses being voted up or down based on its quality. To date, it has over 250,000 topics being answered by users, up from 70,000 just a year ago, and has seen the service grow over the last six months with over one-third of the users coming from outside the United States and less than 10% of new users from California. Something that it discovered was that there’s an incredible experience when users get answers quickly, instead of waiting hours to get a response. In fact, Marc Bodnick, a member of Quora’s business team, says that with faster answers, users are able to make decisions based on what’s on their mind right now. With 25% of the site’s traffic coming from mobile devices, the company is heavily interested in speeding up the process — let’s face it, if you want to see a particular movie and want to know how good it is, you might ask the community on Quora, but you don’t want to wait several minutes to get a response, you want it right away. Online Now hopes to help accomplish that. As an update to its Ask to Answer feature where users use credits to pay others to answer their questions, Quora is enabling people to solicit answers from topic experts that are on the service at that very moment. Through the use of an algorithm, Quora says that Online Now will help you find better people to answer your questions within moments — Bodnick says that it’s always been about connecting users with people who could help answer questions, but now about speed and quality. Prior to today, it was an asynchronous experience where everything was posted and created great content, but now it’s all about the real-time experience and for those situations that are time-sensitive, the company says the experience is going to get better. The topic experts are chosen based off of the quality of their answers with tagged questions, meaning that if user repeatedly answers questions about a particular topic and other people believe the answers are of high quality, then that tips the service’s algorithm to flag that user as a expert to tap for Online Now. Quora says it is respecting people’s privacy by not sharing their online status across the web. A user’s online status only appears in the Ask to Answer suggestion area and nowhere else on the site. It also won’t appear anywhere at all until a user has visited their Quora homepage and viewed the feature announcement at the top of the page — from there, the user can control their notification and online status right from the Settings page. Bodnick tells us that there are several trends happening on Quora. The first one centers around mobility, something he’s really excited to see how many people are coming to the site and responding to questions right from mobile devices. Convention wisdom, he says, is that responding to questions from mobile devices is difficult, but Quora looks to be bucking that trend. Time-sensitivity is another trend the service is seeing where users are starting to see it as being reliable for answers to things they need to make decisions on. This played a big factor in the development of Online Now. Lastly, Bodnick says that the site is receiving a lot of rich content over a diverse set of topics and that there are individuals who are professionals in their field coming by the site and answering people’s questions. An example he gave was having career politicians like Congressman Eric Cantor, Paul Ryan, and Mayor Cory Booker visit the site and respond to posted questions about politics, while famous chefs came by to talk about cooking, and many others offered their advice and insights about their respective topics. Looks like Quora just isn’t just for the tech scene anymore.